Instagram has reinvigorated the square photo format. 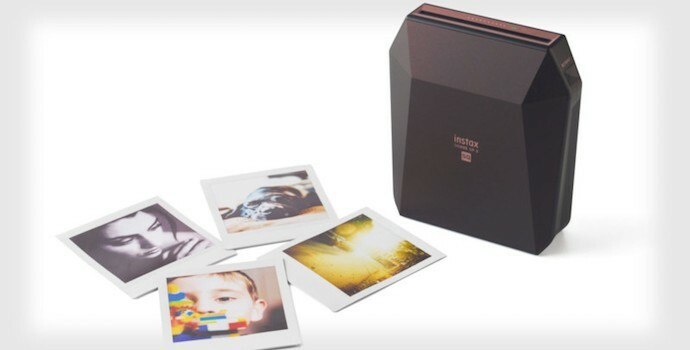 Now electronics manufacturers are leaping to catch up with the trend – enabling you to easily print your favorite Instagram pics at home. Instagram helps subscribers enhance photos taken on their smartphone with filters, stickers and more – before sharing them with friends and subscribers but the photo-sharing app uses a square 1:1 ratio for the images on the platform – which doesn’t sit well with traditional photo printing formats. Enter Fujifilm. The Japanese manufacturer has now launched an attractive square-format printer – its first. The Instax Share SP-3 is designed to work with your smartphone or Fujifilm’s X series of cameras. The sleek 86mm x 72mm wireless design comes in black or white. The batteries take 3 hours to charge, and can print up to 100 photos with every charge. Simply choose your favorite photos and transfer via Wi-Fi from the instax SHARE app to the instax SHARE SP-3. The app features some cool features like split photos and collage, as well as adding text and other customizations. With direct integration with Instagram and Facebook, and the ability to search for images by hashtag, the app is free on Android and iOS devices. Users need to purchase Fuji’s Instax square film which allows for 62mm x 62mm photos. They take just 90 seconds to print (depending on the ambient temperature).